ur mission is to tell the Wright story, and we do that in a number of ways. This virtual museum is one way, of course, but we have several other programs all focused on the same goal – to captivate you with thrilling stories of ordinary men and women who did extraordinary things, and to remind you that those stories are still being written. Aviation and aerospace has been and always will be an empire of unlikely heroes just like you. Since we don't have a museum of our own, our airplanes travel -- we can bring them to a school, a museum, an air show, or any other suitable place or event. We can also bring flight simulators, interactive displays, demonstrations, and other Wright stuff all designed to get you hands on with early aviation. And if you really want to get to know the subject, we will even help you build an airplane! Actually, what we do is help you build an airplane with the involvement of the young people in your neck of the woods. This airplane may be a scientific kite, a Wright Flyer replica, or – who knows? – an opportunity for some heroism of your own. School Presentations The first question that your students will ask us is, "How'd you get that in here?" And the answer is that our clever crew designed a 32-foot flying Wright glider replica that we can get through an ordinary 3-foot door. Meaning that we can set it up in any school anywhere! Along with that aircraft, we send a Wright flight simulator, wind tunnel, interactive displays and a spirited, humorous presenter armed with your choice of four different demonstrations and workshops, each of which reinforce up to 140 national scholastic benchmarks in science, technology, mathematics, and social studies. There are a lot of good STEM programs for schools for you to choose from, but this will be the one your kids remember. WBAC Director Nick Engler demonstrates how the Wrights controlled their 1902 glider to the students of Sugar Grove Elementary School in Sugar Grove, OH. 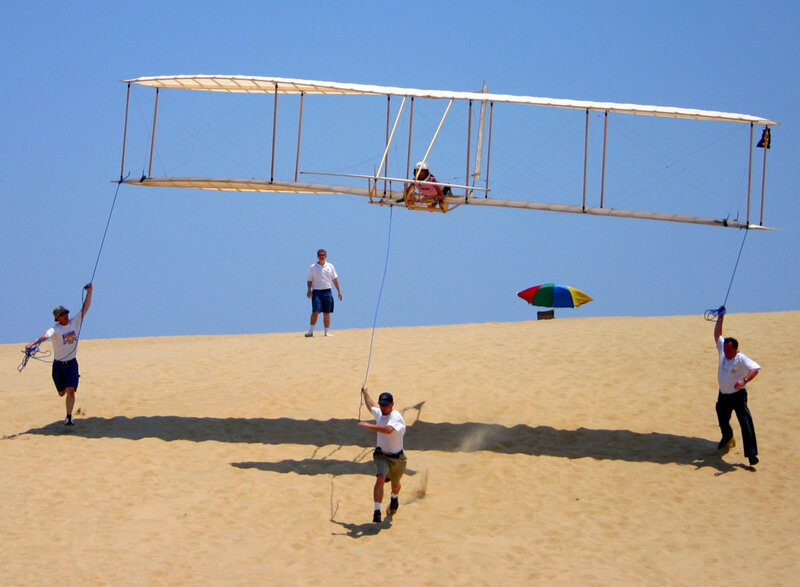 Interactive displays that demonstrate the scientific advances the Wright brothers made with each new glider or Flyer. Together, they capture the excitement that was the very beginnings of aviation and bring the story of the Wright brothers alive. We can also mix and match these aircraft, simulators, and displays to create a special exhibit just for your museum or event. The 1903 Wright Flyer is a difficult aircraft to fly, as you can tell from the expression of pure concentration on the faces of these student pilots. They are flying the Flyer on our Wright flight simulators. To see one of our simulators in action, click HERE! 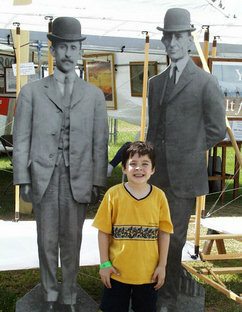 A Replica for Your Museum Looking for a Wright Flyer? We offer historically accurate reproductions with a marked difference. Almost every Wright aircraft in our collection was built with the involvement of young people. They build and sign the ribs in the wings, then we assemble the signed ribs in an historically- accurate replica. So popular is this program we haven't been able to turn it off, even after we produced all of the Wright experimental aircraft. Now we're producing those planes for other museums and institutions. If you'd like a Wright Flyer to hang in one of your display halls, we work with the young people and parents in your area to build it. It's a great way to drum up local interest and good PR. But wait; there's more! We also throw in a flight simulator for your Flyer, so this extraordinary interactive program produces an extraordinary interactive display. Shine a bright light on the cloth that covers the wings of the Wright Flyer replica in the atrium at the Dayton International Airport, and you'll see the signatures of more than 300 young people who helped build it. 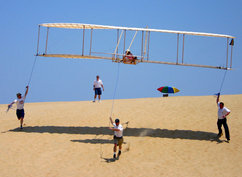 Students from Russia Local Schools in Russia, OH fly their 1902 Wright Glider replica at Jockey's Ridge State Park in Nags Head, NC, just a few miles south of Kill Devil Hills. To watch them fly, click HERE!